MathNook welcomes all students and teachers back to school and hopes all of you have a great school year! From the lack of postings it may look like we took the summer off. The fact is we’ve been busy updating the website and adding more math games, puzzle games, worksheets and tutorials. We’ve got lots more great math games and puzzle games on the way so stay tuned. Hopefully the new category links will help you find the type of game you are looking for. If not you can always use the new improved search function or see all of our math games by clicking the “All Math Games A-Z” link or all of our games (puzzle, fun and math) by clicking the “All Games A-Z” link. These links can be found at the top of the page in the category slider. If those links aren’t on the screen just use the blue arrows to scroll to it or wait for it to rotate around again. And please feel to drop us a line at [email protected] We’re always ready to help and are open to suggestions, constructive criticism, and of course compliments. Lots of new Math Games added. Check out the “SEE OUR NEWEST MATH GAMES” link on MathNook’s home page to see and play them. Digit Drop Integers – Skills: addition, subtraction, multiplication or division using positive and negative integers. When I look on the forums where students ask questions I’m always shocked at how many questions pertaining to writing computer games always seem to be with the student asking if they need to know math to have a career writing computer games. And it seems from the number of questions that I see that writing computer games is high on students list of careers they’d like to pursue. The short answer to their question is YES. As I wrote in one of my previous posts, even computer artists who create animations can benefit from the use of prime numbers. Okay that question has been answered, but would that convince a student? Maybe it would for some of them, but for the ones looking for real life examples maybe not. So out of curiosity I looked at one of the math games I had written for www.mathnook.com to get an actual count of how many math operations were used in the program. No good because even though the math part of the program is fairly small compared to the rest of the math used in the program it is still a math program. I figured someone looking at the statistics would just figure that of course a math program would have a lot of math in it. So I looked at another game that was not math related. It is called Space Traffic and can been played on www.mathangle.com. •	94	Comparison statements ( >, <, =, >=, <= ) •	4	equations using PI •	4	equations using cosine •	4	equations using sine •	2	boolean operations •	75	variables defined with values •	39 boolean variables defined •	2	negative integers used •	22	equations using addition •	3	equations using subtraction •	15	equations using multiplication •	4	equations using division •	4 arrays defined •	47	statements using arrays If you haven’t seen Space Traffic, it consists of cars passing through a 4 way intersection. The object is to keep the cars from crashing by clicking on a car to speed it up. It only has one level and is considered by today’s standard to be a fairly simple game. 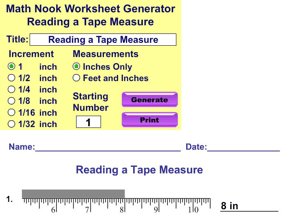 New Free Math Worksheet Generator added. I married into education or you mean to tell me teaching isn’t easy. So, my experience with education was fairly limited up until the time I married into education. I was exposed to one year of church kindergarten, 12 years of public education, and six years of college that should have only been four. And it wasn’t like I was sitting at the back of the class the entire time, although I did spend a great deal of time back there. And if you had asked me I probably would have said I knew quite a bit about education. That is up until the time I married an educator. Marrying an educator was definitely an eye opener for me as up until that time I had only worked at corporations and mostly knew and socialized with non-educators. Not intentionally mind you, that’s just the way it worked out. So, up until the point of marrying into education I held the view that many non-educators do. And that is that teaching is kind of a cushy job with lots of long holidays and a long summer vacation with pay. I’m exaggerating some but I really didn’t realize how difficult a profession it was and how much time an educator spends working at school and at home. Once I married an educator I got to see firsthand how much free time is spent preparing for school, grading papers, prepping the classroom, or attending in-service meetings. Even though I’ve had to work 24 hours straight in several emergencies over the years the amount of time I spent on work outside of normal hours pales in comparison to how much time my wife spent on school related activities. Some other things that surprised me is that even such things I took for granted such as endless supplies of office supplies are treasured in some schools. Even paper clips which I’ve seen people throw away when they get slightly bent. Something else that never dawned on me is that teachers can’t take a little extra time at lunch to run errands and lunch might consist of lunch duty. I had seen enough that after several years of marriage I knew that my wife should retire as soon as she was eligible. She was a little worried about making the decision but I helped her by telling her that she had to for her health. My thoughts were how much stress can a person continually take. If you know of someone who needs an education like I did, please let them read this post. Probably best that they don’t leave a negative comment about educators though as I am worse than a believer in educators, I am a reformed non-believer!